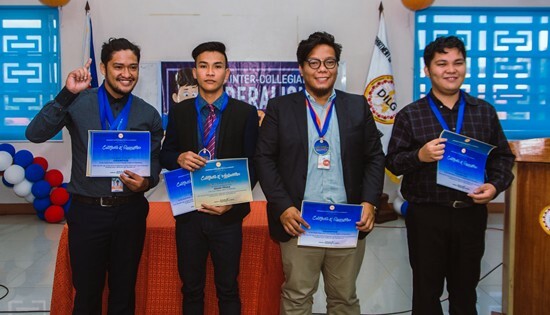 TACLOBAN CITY – A team from Eastern Samar State University (ESSU) bested their counterparts from the Leyte Normal University (LNU) in the championship match of the Intercollegiate Federalism Debates led by the Department of the Interior and Local Government (DILG) on April 24, 2018 at the DILG-8 Regional Training Center, Tacloban City. DILG Regional Director Marivel C. Sacendoncillo bared that ESSU’s Jeric Ueno Montes also won as Best Debater and Best Speaker. Aside from Montes, other team members were Wences Alfon Café as first speaker, Joseph Jay Ayon as second speaker and Christian Daniel Campomanes as Researcher, with Ma. Teresita Quillo and Minerva Acedillo as coaches. LNU which was tasked with the affirmative side of the proposition, “Resolved that the country shall adopt a federal form of government”, was represented by Raymond Enriquez (1st Speaker), Larry Mark Orbong (2nd Speaker), Kay Ann Torre (3rd Speaker) and Ave Maria Elizabeth Nacman as Researcher with Charles Abanilla and Ara Joy Pacoma as coaches. The Integrated Bar of the Philippines (IBP) Leyte Chapter led by Atty. Leo Giron as program partner brought in its big guns, with Judge Tarcelo A. Sabarre Jr. (Regional Trial Court Branch 30), Judge Wenifredo C. Cuaton (RTC Branch 11) and Judge Mario O. Quinit (RTC Branch 17) as adjudicators for the championship. According to Director Sacendoncillo, the Tacloban leg of the debate series was broadcast live over DYVL AksyonRadyo 819 KHz and streamed live over DILG Region 8 Facebook Page. A delayed broadcast is set for showing over IBC 6 Leyte. The championship culminated a series of 10 provincial elimination matches, 4 quarterfinals matches and 2 semifinal matches that were joined by some of the biggest colleges and universities in the region. The champion team received a plaque, medals, certificates and P20,000 cash, while the 1st runner-up team likewise received a plaque, medals, certificates and P10,000 cash. A plaque of appreciation was presented to IBP-Leyte chapter as program partner. Certificates of appreciation were presented to DYVL and Prof. Arvin de Veyra, the moderator. Meanwhile each team of semifinalists from Visayas State University (VSU) and Samar College (SC) was awarded medals, certificates, and P5,000 cash prizes during the previous day’s awarding rites. The debate series was made possible through the support of the DILG Central Office and DILG Local Government Academy. DILG initiated the collegiate debate championship as part of its information and education campaign on federalism. It aimed to explain the concept of federalism and related issues on constitutional change among young people who compose majority of voters.